The Toms Tactical AR15 Kit Mil-Spec Buffer Tube Assembly is 100% made in the USA. The mil-spec buffer tube is manufactured from 7075-T6 aluminum and features hard coat anodizing and dry lube internal finish. The 7075-T6 aluminum tube is nearly double the strength of 6061-T6 aluminum found in most other “mil-spec” and commercial buffer tube variants. The dry film creates a semi-permanent application of solid lubricant for maximum wear resistance. The castle nut and end plate are made of high strength steel and phosphate coated. 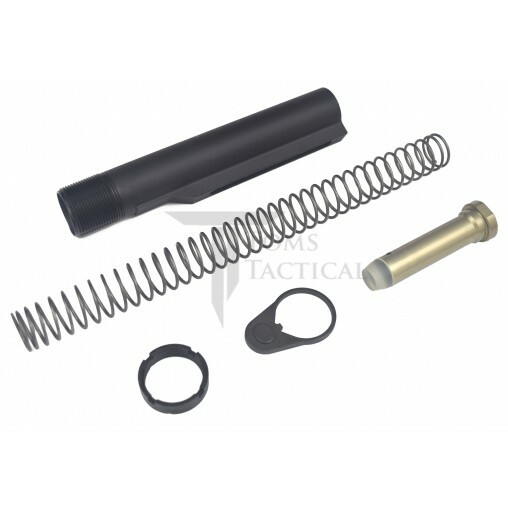 The spring is made of premium quality steel that is designed to produce minimal sound. This kit will work with any mil-spec AR-15 lower receiver. All Tom's Tactical brand products include a lifetime warranty. If you are not sure which buffer to choose, we recommend choosing the standard carbine buffer. Very good quality, great price, easy to install, will be buying more. Only Tom’s allows you to pick the buffer weight all the while giving you true 7075 tubes that are even finished properly. Fit finish top notch. Same quality as the big 3 letter brand at a fraction of the cost. Buy without hesitation. Got this for my 450 Bushmaster build. Great fit. Now I need to do find some hogs. Purchased this for an inexpensive build. The quality of the tube and H1 buffer was better than the one on my $2000. gun. So I switched it. Works great. Shipping was very timely got the product in 3 days. Great fit and finish on this tube that holds the shoulder thing that goes up. Excellent value. No need to pay double or more elsewhere.